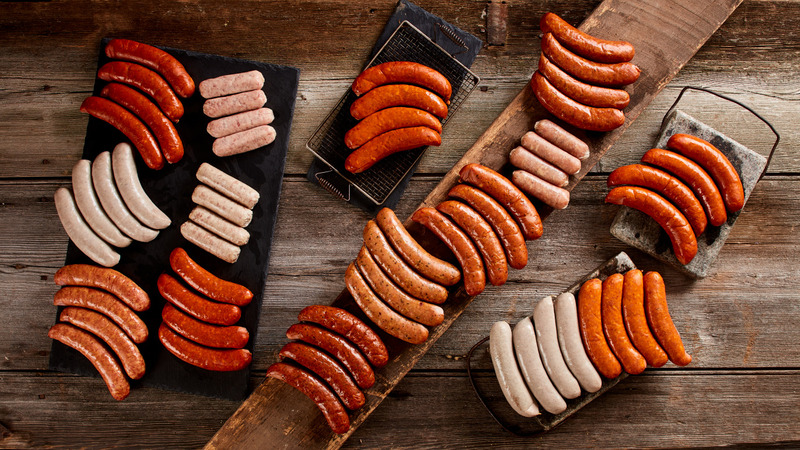 Part of what makes our sausages so special is that every ingredient is top quality, authentic, and chosen with care. Filled with coarsely ground, lean meats in unobtrusive, natural casings, each robust link is bursting with its own well-rounded palate of distinctive, natural seasonings. Our full menu of ethnic European and regional American recipes range from pungent old-world favorites to lean and subtle poultry sausages, each celebrating the melting pot that defines our country and the pride of the people make them. Each variety arrives fully cooked and ready to savor. Like generations before us, we make our kielbasa with natural casings and the heady aroma of marjoram and onion. Using a traditional Emerald Isle recipe that combines pork, spices, and rusk (bread crumbs), this mild star of the pub favorite bangers and mash is steamed rather smoked. Our smokehouse sits in the middle of maple country, so years ago it made sense to craft this smoked breakfast favorite using pure, dark syrup from a nearby sugarmaker as a sweet marinade before we smoke them over applewood fires. Red pepper, cumin, and other Mexican spices are blended with a sweet brandy to balance this sausage’s southwestern heat. Our fastest-selling sausage is also our spiciest: andouille. A Louisiana hot-link sausage spiced with black, white, and red pepper and smoked for hours. This exceptional pork sausage is infused with the subtle licorice notes of fennel and the distinctive flavor of Tennessee whiskey for a warm, aromatic sausage that's anything but expected. We craft these sausages using pure, dark syrup from a nearby sugarmaker as a sweet marinade before we smoke them over applewood fires. Our sausages are fully cooked place in a fry pan with vegetable oil for approximatley 12 minutes turning occasionally. discounts, seasonal recipes, and more! © 2018 North Country Smokehouse. All Rights Reserved.